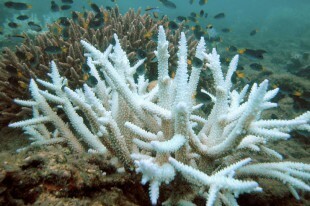 The Caribbean is currently experiencing the biggest mass coral destruction ever recorded. This according to the United States National Oceanic and Atmospheric Administration (NOAA), which confirmed that the bleaching of reefs in the Caribbean, Atlantic and Pacific may affect over 38 percent of the world’s reefs, and kill over 12,000 square kilometer of them. Reefs are the breeding ground for tropical fisheries and this reality endangers the livelihoods of 500 million people who rely on the seas and oceans, which also provide shelter from the waves for tropical islands and bring tourist revenues. Scientists warn that coral reefs that are already under threat from human activities are unlikely to survive increase in temperatures by the end of this century.